“If you can hold the progress of disease in check and, if you can stimulate and enhance ones own defense mechanisms (which is your immune system), there are no diseases which your body is not capable of conquering.” ~ Dr. Terry Pulse, M.D. The Original Chi Machine© home aerobic exerciser, oxygenates, tones, strengthens the body, increases feelings of energy, aliveness and well-being, stimulates lymphatic system, exercises and balances spine, 100% satisfaction guarantee or your money back. The idea behind this unusual aerobic exerciser was suggested by Dr. Shizuo Inoue, Chairman of Japan’s Oxygen Health Association. Dr. Inoue, who has spent decades researching the relationship between oxygen levels in the body and the quality of human health, got his idea by watching goldfish swimming. Noting how remarkably healthy and well-toned fish are, Dr. Inoue thought that perhaps the steady undulation of the spine causes the fish’s whole body to be exercised and oxygenated. What would be the effect on people, he wondered. If we could move like fish? Why get Chi Machine Combo? 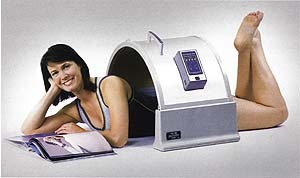 Using The Chi Machine and HotHouse in combination is an even more powerful way to balance the energies in your system. The HotHouse uses thermal energy in the form of Far Infrared Rays (FIR) to improve circulation even further. The blood is primarily composed of water. Over time, toxins such as ammonia and heavy metals can cluster around these water molecules, impairing circulation. When the water molecules in the body are exposed to FIR, they easily absorb this energy and begin to vibrate quickly (resonance). These vibrations breakdown the bonds holding the water-toxin cluster together. Since the water molecules are energized and free from toxins, the blood flows smoothly, bringing even more oxygen and nutrients to the cells. We can look at this process from the perspective of the body transforming Chi from thermal energy to motion energy. This new Chi boost of motion energy is manifested by increased circulation – much like when a drainpipe is unclogged. The thermal energy from the HotHouse also expands the blood vessels, allowing a higher volume of blood to pass through. This increased circulation means the cells are receiving a regular supply of nutrients and oxygen, accelerating metabolism.